Looking for the best water distiller to get the purest water to drink? A countertop water distiller will be a must-have item for those who want to drink the utmost pure water at home or when traveling. Actually, our public water contains so many contaminants, and we need a water treatment device to get rid of them. A water distiller can boil the water to become steam, and then steam rises and is led into a clean container to condense. A filter is also used to further remove any impurities. Most contaminants are left in the boil chamber and they cannot rise with steam. Therefore, a distiller can remove contaminants like chemicals, heavy metals, virus and bacteria. You may think distillers on the market are a little pricey. However, compared with buying bottled water, having a distiller is relatively cheap in the long run. And bottled water is really a threat to our environment. The following top 5 best countertop water distillers were chosen because they strike a good balance between price and performance. They are all well-built and durable. Some of them use glass or stainless steel materials to avoid any contact with plastic. Therefore, you don’t need to worry about the plastic could pollute our water again. We don’t like some fancy add features, but we also love some useful features. For example, one unit on this top 5 best list has pre-programmed function which allows you to program it when to start. Therefore, you can get clean water to drink in the morning when you wake up. We also consider other factors, such as ease-of-use, low maintenance cost etc. If you need an inexpensive distiller, this Megahome water distiller is your best choice. The price is so friendly, but it also comes with high quality and great performance. It is easy to use, too. It is also one of the bestselling and most popular models on the market. This distiller can fit on any countertop and can offer you up to 4 gallons of pure distilled water every day. This means it can produce 1 gallon water in 6 hours. Besides the distillation process, it also uses carbon filters to remove VOCs that cannot remove during the process of distillation. Therefore, it is able provide you with pure water. It is quite easy to use and no installation is needed. An automatic shut-off feature is also included, making it safe to use. This means when it finishes distillation and there is no water in its chamber, it will shut off automatically. Plus, it uses a glass jar to collect water. Although it is a little difficult to clean, a bottle cleaner brusher can do the job. If you need an affordable distiller, this is a good choice. Make 1 gallon distilled water in 5.5 hours. Its interior are made of Full 304 stainless steel, so water doesn’t contact plastic. A glass collector is included. Offers a 1 year warranty. Megahome is a famous brand on the market, specializing in water distilling. This is a home water distiller which doesn’t take up much space on your counter. This distiller is able to produce 5 gallons of distilled water per day and can effetely remove many contaminants and kill virus and bacteria through water distillation and filtration. It uses a carbon water filter to further remove VOCs and this carbon filter is made from an environment friendly organic coconut shell. The distilled water produced by this model tastes clean. To prevent mineral build-up, you need to clean it regularly. It is really a lightweight, compact, portable and affordable distiller you can rely on. You even can take it to travel. Another best water distiller from Water Wise is this model 8800. It is very easy to use and can provide you with clean and safe water to drink. The most impressive feature it attracts me is its programmable feature, which allows you to set it before going to bed and in the morning clean distilled water is ready for your family. It is also pretty easy to use. You just need to fill tap water or well water in tis stainless boiler, press the start button and leave to allow its distillation and carbon filtration to do the rest. It is able to work all day long and it is able to produce 1 gallon of pure water in about 4 hours. An LCD is also included to help you easily read its status. This is really a great choice, if you need an advanced water distiller. This model is a little pricey, because it is built without any plastic. Therefore, this Mini-Classic ll Counter Top Pure Water Distiller is perfect for those who don’t want their water to exposure to plastic. It is very durable and easy to use. And it is totally made in the US. It can be a countertop distiller and you also can place it under your sink or counter. It is able to offer you 1 gallon of pure water every 4 hours. Plus, it is also programmable. This means you can program it to work and when you come back, clean and pure water is available. It uses a manual drain to clean the residues and regular cleaning is highly recommended. If you need a high-end distiller, it is definitely the best choice for you. is built of stainless steel which is very solid and durable. A glass jar is also included, prevent the plastic from polluting water again. Like Water Wise 8800, this best water distiller is also a programmable unit. This distiller is manufactured in the USA. Besides distillation, it also uses carbon filtration to polish water again, making it taste clean without any odor. If you need a stainless steel construction, programmable, easy to use and affordable distiller, it is definitely the best choice. 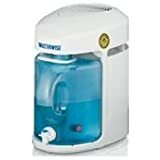 If you don’t have enough budget on expensive models, there are also many other options when it comes to the best cheap water distillers. And we have made this list for you, based on their design, ease of use, prices, ratings and customer reviews. If you just need a water distiller that is cheap but also has a compact and sleek design, you can choose this one. It is very powerful and efficient. It only cost you no more than $100, but can remove impurities in the tap water. Once you have it, you can always get pure, healthy and safe distilled water to drink and cook. What’s more, it is lightweight, making it portable to take. If you want to travel aboard but feel worried about the water quality, it will be a good partner. 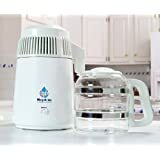 This best cheap water distiller is an electric water distiller which can distiller about 1 liter distilled water within 3 hours. Due to its sleek and compact design, it is very portable, making it easy to use and allowing you to take it anywhere. It is easy to use and no installation is required. Due to its sleek design, it will not take up much countertop space. And it will automatically shut off once temperature rises up to 160 degrees. Therefore, it is safe to use. This is another budget-friendly countertop water distiller you can trust. Generally, it is able to produce 4L distilled water in 4 hours, which means you can get 1L distilled water per hour. Once you have it, it can remove many contaminants from the tap water, such as particles, bacteria, VOCs and dissolved solids. Of course, it is also very safe to use. Once the temperature reaches 160 C, it will shut off automatically. Due to its great performance and portability, it is perfect for office, home, labs, laboratory, as well as travel. 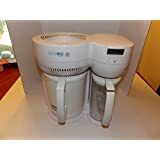 This best home water distiller is FDA&CE listed, so you can buy it without any doubt. It is well built and safe and healthy to us. It is able to distill up to 6 gallons of distilled water per day. Thanks to its built-in thermostat, overheating will not happen, making it safe to use. Due to its large openings design, it is easy to access, making it easy to clean. And it is also very quiet, so you can make run at night. Although it is cheap, the inner tank, inner cap, water outlet and condensing coil are all made of 100% 304 stainless steel. The plastic is also made of BPA-free plastic. Therefore, due to its high quality building materials, it is healthy to use. And this one also offers a 1-year warranty, so you just feel free to get it. This is an affordable 4L water distiller. Its body, inner tank, filter and cover are all made of stainless steel. It also comes with a glass water jar to hold distilled water. It has a handy design, making it easy to get distilled water for drinking. If you need one, you can get it to make distilled water anytime and anywhere you like. Distilled water is the purest water that is resulted after distillation. What is water distillation? Actually, water distillation is a process that used to separate substances or components in the water from the water. Source water is heated in the steam chamber and become to evaporate. In this process, other substances or components are left in the steam chamber, while liquid water becomes vapor and finally vapor is condensed to become liquid water(distilled water) again in the condensing container. Except VOCs, other types substances and components are not in the distilled water. Ideally, the pH of distilled water should be 7. However, distilled water has a lower pH. This is because when it is exposed in the air, it can absorb CO2 to form carbonic acid in the water, lowering its pH. Therefore, after you get fresh distilled water, you’d better store it in a sealed container, reducing the chances of contacting the air. Of course, minerals cannot be evaporated, so they are left in the steam chamber. Therefore, distilled water is naturally deficient in minerals, making it taste a little flat. Fortunately, some water distillers come with a filter that can add minerals back to the water, improving its taste. Generally, a water distiller is a device that is used to make distilled water. Distilled water is regarded as the purest and safest water in the world. Such a device can offer high quality water by distilling water. The basic process of distillation is the same on every water distiller. Distillation is a very old way used to purify water. First, water is heated to boil in a container, and then mass water vapor or steam is produced. The steam is lead into a clean container. During the process, steam is condensed into liquid water again. As a result, we get pure water, because other substances are left in the boiling chamber. Distilled water tastes tasty due to the removing many contaminants in the original water. A water distiller follows the below steps to make distilled water. Firstly, the boiling chamber is filled with tap water or well water. Apply power and the built-in heating element will heat the water in the boiling chamber to boil. The boiling water procures mass water vapor or steam. And then, the steam begins to rise. And when it passes through a built-in vent, the gases will be discharged. While minerals, as well as other salts are left in the boiling chamber in the form of hard deposits or scale. The steam will be led into the condenser and will be condensed into water again. Mostly, the condensing process needs a cooling fan to do the job. As a result, we can get liquid water that is distilled water. Some advanced water distillers also have carbon filters which are used to remove other gases from water. These gases are VOCs that rise together with the steam. Last, after a cycle of distillation, we can get a large amount of distilled water in the condensing room. Water distillers buying tips and guides. When planning to buy a new distiller, something should be taken into account. The following tips are useful. Manual distillers – This type of distillers is used to make distilled water at home. As home water distillers, they can make 1 gallon of distilled. When a cycle is finished, the system will be shut off automatically. To make it work, you need to refill the boiling chamber with tap water again. Automatic Distillers – This type doesn’t need you to refill the water time and time again, because they have built-in water line for automatic refilling. This type is used to offer continuous distilled water time and time again. They are normally designed for commercial use. How much water does it produce per hour? This is measured by water production rates. Different units have different storage tanks and boiling chambers, and the water production rates are also different. Generally, if the unit is a manual one, the production rate is the amount of water the distiller can make per hours. If the unit is an automatic system, the rate is measured by the amount of water it can produce per day. The holding capacity means the maximum water a distiller can store after each cycle. 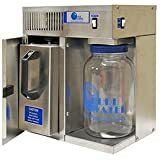 Most home distillers can hold about 1 gallon water, while automatic distillers can hold 3-25 gallons of water in their stainless steel reservoir. Compared with the municipal water, there are many benefits of drinking distilled water. Therefore, we have enough reasons to choose distilled water. And I will explain them one by one. No Copper. As a compound, copper can be found in both municipal supplies and well water. If you ingest of copper for a long time, there is a high risk of developing Alzheimer’s. No Barium. Barium can lead to heart problems, which can be found in the municipal supplies. A related study indicates a high blood pressure can be determined in lab animals. No Nitrites or Nitrates. Both Nitrites and Nitrates can be found in our drinking water, no matter you drink municipal water or well water. For both elderly and children, these harmful compounds are dangerous. If large quantities are ingested, there is a high risk of causing lethal accidents. No Chlorine. If you hate the bad smell found in municipal water supplies, you need distilled water. Chlorine is widely used to treat municipal supplies. However, recent studies show chlorine may cause some several illnesses. Fewer Microorganisms. Most microorganisms are killed in the boiling water, and this means there are fewer microorganisms in the distilled water. Cheaper than bottled water. If you like drinking pure water, distilled water is much cheaper than buying bottled water. And this also means fewer plastic bottles will be consumed, which is harmful to our environment. Helps With Detoxification. Distilled water can be used to flush the dangerous toxins in your body. You can drink distilled water for good results. However, you need to supplement some essential minerals. The Purest Water in the World. Distilled water can be used in many fields, such as in laboratory, industrial, perfumery, medicinal and even in food processing industries. This is because distilled water is much purer and preferred by industries. Some people don’t believe in distilled water and the following FAQs can be helpful. Is drinking distilled water bad for our minerals intake? This is true to some degree. About only 15% mineral intake comes from the water we drink. Most of our mineral intakes come from our ordinary diet. Therefore, if you drink distilled water, you also can supplement minerals from the food we consume. Does cooking with distilled water remove the healthy minerals from our meal? Well, this is not true. No matter which type of water you used to cook, the nutrient value of your food will be lowered. Therefore, the only thing we need to do is to avoid of overcooking. For example, we can choose steam cooking instead of other types of cooking. Will Distilled Water Weaken Your Teeth? Well, this is also not true. No matter how long you have drunk distilled water, fluoride will not be drained from your teeth. Of course, it can remove the fluoride from the water. And most of our toothpastes have enough fluoride to protect our teeth. Does Distilled Water Taste Flat? This is true. This is because no mineral is left in the water. If you dislike the flat taste, you can add some juice, salts or minerals to make it better to taste. Can VOCs Be Removed By Distillation? This is true to some degrees. VOCs have a much lower boiling temperature and they rise along with the steam and will be condensed in the result water. However, most water distillers use a carbon water filter to remove VOCs in the steam. Therefore, this is not a big problem. Is Distillation Expense? This is also not true. You only need to buy home water distiller and it will be powered by electricity from the grid. It is estimated one gallon of distilled water will only cost you about 30 to 40 pennies. Compared with buying one gallon of bottled distilled water, it is very cheap. Where to buy distilled water? Or where to get distilled water? Of course, it is not recommended to doing that. You can buy a home distilled and make distilled yourself. On the other hand, you can buy bottled distilled water at some online stores, like amazon. What’s the difference between distilled water and deionized water? You can click here to learn more. Is bottled water distilled safe to drink? Well, it is safe to drink. However, don’t allow distilled water to contact with the air for a long time. The CO2 in the air will make it become acid. And you can use a home distiller to get fresher water to drink. We need to drink water every day and high quality water can protect us and guarantee our health. A water distiller is a great device that can provide us with pure water every day. Now, don’t hesitate to buy a water distiller. And our home water distiller reviews can help you make a wise decision on choosing the best water distiller. I see no mention of H2O LABS brand of water distiller. It seem among the most reputable builders of these products. Very interesting. Thank you for your time and consideration. 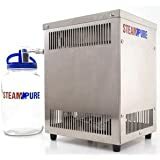 I shall proceed to purchase the Steam Pure Stainless Steel Counter Top Water Distiller right away. I love my Megahome water distiller, it distills about 4 gallons of pure water every day. It’s enough for me and my family and water tastes great!